Design of Solar Thermal Power Plants introduces the basic design methods of solar thermal power plants for technicians engaged in solar thermal power generation engineering. This book includes the author’s theoretical investigation and study findings in solar heat concentrators, a performance evaluation of solar thermal collectors, a numerical simulation of the heat transfer process between complex geometrics, heat transfer through radiation, and more. 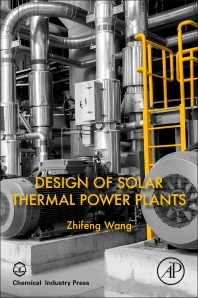 Containing theoretical descriptions of solar concentrators and receivers, practical engineering examples, and detailed descriptions of site selections for solar thermal power plants, this book has a strong theoretical and practical value for readers. Zhifeng Wang, researcher at the Chinese Academy of Sciences and professor at the University of Chinese Academy of Sciences, received his PhD from Tsinghua University’s Department of Thermal Engineering. Dr. Wang’s research interests include solar thermal power generation technology, performance evaluation of the solar energy utilization system, flow and transfer of heat in the solar heat-collecting system, numerical simulation of the flow and heat-transfer process in the heat exchanger, heat transfer through radiation in complex gas media, numerical simulation of the heat-transfer process in complex geometrics, and performance evaluation methods for solar energy heat-utilization systems.